Arguably, a photograph’s natural habitat is on paper. The image eases into the soft crevices and wrinkles, lending a depth of texture which seems to draw the flat picture into life again. The swoop of a curving torso, the well of shadow pooling in a collarbone, the luminosity of a thigh. It surpasses tangibility to become something which communicates not with the active mind, but the subconscious, the part which needs no words to understand. 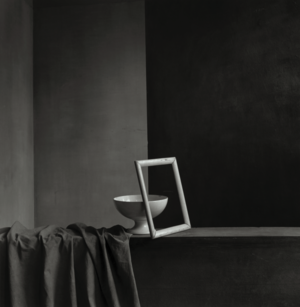 Christian Coigny’s photography grasps this concept with confident delicacy. Working mostly in black and white, and always with film, his portfolio spans nearly over half a century, gradually honed over the years to its purest form. He’s exhibited in Sweden, Belgium, France and Switzerland since the 1970s, and photographed for brands such as Hermès, Ferretti, Bongénie Grieder, Chopard and Vitra. Six hundred miles apart, I speak with Coigny, who is jovial, despite the early hour of the interview. He has the type of voice you can hear the smile breaking across his face. Coigny is Swiss, residing near Lausanne in Lutry, on the banks of Lake Geneva. The juxtaposition of the drizzly woody landscape around me to the vision of crystal blue waters makes my heart ache. It is in this place Coigny was born, raised and still lives. He begins, as most stories start, at the beginning. After a brief stint at Vevey School of Photography, Coigny spent five years in San Francisco, learning and developing his skills, particularly in black and white film. Throughout the mid to late 1970s, he took numerous trips to Milan, Paris and London to break into the hectic world of fashion. Although there were difficult periods without work, he remained dedicated to his pursuit, until he had a revelation. Find the complete story in the printed version of Volume 1, available HERE.